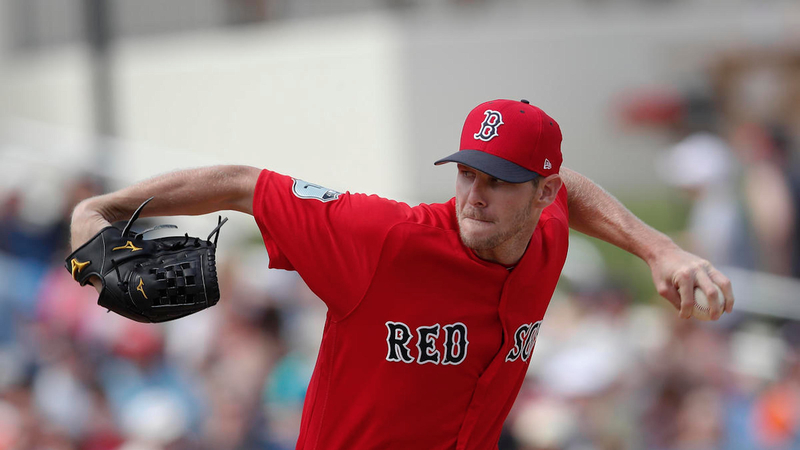 The Boston Red Sox defeated the Tampa Bay Rays 6-3 behind another stellar performance by lanky left-hander Chris Sale who struck out double-digits for his seventh straight start. The Red Sox have won Sale’s last three nods along with five of his last six starts. He threw seven innings with 12 strikeouts and only two walks and his three earned runs came on two mistake pitches to Logan Morrison and Kevin Kiermaier. The first run of the game came off the bat of Morrison, who drove a Sale change-up left down the middle to the Red Sox bullpen for a solo home run. Sale also left a letter-high 98 MPH fastball on a 0-2 count to Kiermaier who drove it to right-center giving the Rays a 3-2 lead in the fifth. Sale is one start away from tying his record, shared with Pedro Martinez, for eight straight starts with double-digit punch-outs. Sale previously completed this feat in eight starts back in ’15 with the White Sox from May 23 to June 30. Pedro completed the task while playing for the Red Sox, to end the 1999 season, from August 19 to Sept 27th. In technicality, Pedro is the sole possessor of the most consecutive starts with double-digits strikeouts. His dominance continued into the 2000 season where his first two starts resulted in a 11 and 12 strikeout performances. Chris Sale draws similar comparison to the Martinez with his abundance of strikeouts as he is on pace to potentially break Pedro’s single season K/9 record of 13.2 as he has already posted a 13.04 K/9. Sale has been assertive with his four pitch mix, dominating batters with 85 strikeouts in his first 8 starts. According to Elias Sports Bureau, this number lands him beside the Big Unit(Randy Johnson) for the most strikeouts(85) in 8 starts with a new team. Johnson completed this feat in 1998 during his short stint with the Houston Astros; where he posted a 10-1 record with a 1.28 ERA while fanning 116 batters in 84.1 innings. Similarly, Sale has a 4-2 record with a healthy 2.15 ERA fanning 85 batters in 58.2 innings while only walking a mere 13 batters. In his last start, Sale became the fourth pitcher in MLB history to have thrown multiple streaks of 6+ games of double-digit strikeouts, joining Big Unit(5), Pedro(3) and Nolan Ryan(2). Sale’s effectiveness could be contributed to his crafty 3/4 arm angle coming from the left side of the hill. His slider and change-up both drop off the table while he changes speeds with a four-seam, two-seam and sinker fastballs. Chris Sale’s next start is scheduled for May 18 at 10:05 p.m. against the Oakland Athletics. CJ Rogers is currently a student-athlete at Emerson College while majoring in Journalism. He using sports journalism as a way to still interact with the games he loves on another level. He is also Executive Producer for Emerson Channel Sports.